I have been on this ship last year (Feb 2018)(Tampa/Belize/Roatan/Cozumel/Costa Maya) and it was an excellent experience overall. My partner and I booked this ship again and did a Mediterranean cruise (Venice/Dubrovnik/Kotor/Santorini/Katakolon). I was excited initially as I brought my brother and sister-in-law and it was their first time to cruise. Can’t really complain with the cabin as we booked an interior cabin and it served its purpose considering we will be out most days anyway. However, we have noticed that there are elements in the room that are really run down and needs replacing. But for the price we paid, didn’t really bother me that much. The embarkation was ok, no complaints, pretty smooth actually. So on the first day, probably due to the weather, there was no sail away party! Even an indoor party would’ve been nice to have set the mood. It was all a bit blah. Also disappointed that there was no lobster night! Was informed they don’t do lobster nights on a European cruise. Food was better, the food in the main dining room was excellent. Really enjoyed it. The cruise director Elvis got better towards the end. I like his sense of humour but there’s not enough of him! I only liked two cruise director staff - Tanya and Gianni. The rest needed some personality transplant. Ports of call could’ve been excellent, the weather was just a let down! Maybe do this cruise in the summer months or you’ll be experiencing rain!!! Having said that we still enjoyed it! Now to the biggest letdown - The entertainment! The headliner shows were alright. The production shows however are the same 21 months ago!!! Although the 4 singers were better than the last time, the faces of a couple of dancers were really distracting. It’s like “look at me and my showbiz jazzy robotic smile”. You’ll know what I mean when you see it. Also I had my LASIK surgery since I last cruised with Rhapsody and got better than 20-20 vision and I could not believe what I saw - the female dancers were wearing wigs with chin straps!!! They look horrible! And the amount of pirouette they have in each number was outrageous. It’s like I’ll stretch my legs to the right do a pirouette, move to the front and do a pirouette! My head was spinning watching. Defo need a new choreographer and wardrobe. Now with the costumes - I think it slightly got better the last time but I couldn’t help but chuckle in one number when the female dancers were dressed like red condoms with a glittery hand on their head! I mean what was that!!! Overall, it wasn’t my favourite. 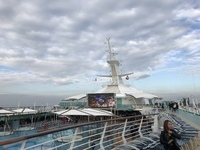 Not enough activities onboard either since we can’t sun bathe due to the weather. Just a shame as I loved this ship the first time around! I have been on this ship last year (Feb 2018)(Tampa/Belize/Roatan/Cozumel/Costa Maya) and it was an excellent experience overall. My partner and I booked this ship again and did a Mediterranean cruise (Venice/Dubrovnik/Kotor/Santorini/Katakolon). I was excited initially as I brought my brother and sister-in-law and it was their first time to cruise. Can’t really complain with the cabin as we booked an interior cabin and it served its purpose considering we will be out most days anyway. However, we have noticed that there are elements in the room that are really run down and needs replacing. But for the price we paid, didn’t really bother me that much. The embarkation was ok, no complaints, pretty smooth actually. So on the first day, probably due to the weather, there was no sail away party! Even an indoor party would’ve been nice to have set the mood. It was all a bit blah. Also disappointed that there was no lobster night! Was informed they don’t do lobster nights on a European cruise. Food was better, the food in the main dining room was excellent. Really enjoyed it. The cruise director Elvis got better towards the end. I like his sense of humour but there’s not enough of him! I only liked two cruise director staff - Tanya and Gianni. The rest needed some personality transplant. Ports of call could’ve been excellent, the weather was just a let down! Maybe do this cruise in the summer months or you’ll be experiencing rain!!! Having said that we still enjoyed it! Now to the biggest letdown - The entertainment! The headliner shows were alright. The production shows however are the same 21 months ago!!! Although the 4 singers were better than the last time, the faces of a couple of dancers were really distracting. It’s like “look at me and my showbiz jazzy robotic smile”. You’ll know what I mean when you see it. Also I had my LASIK surgery since I last cruised with Rhapsody and got better than 20-20 vision and I could not believe what I saw - the female dancers were wearing wigs with chin straps!!! They look horrible! And the amount of pirouette they have in each number was outrageous. It’s like I’ll stretch my legs to the right do a pirouette, move to the front and do a pirouette! My head was spinning watching. Defo need a new choreographer and wardrobe. Now with the costumes - I think it slightly got better the last time but I couldn’t help but chuckle in one number when the female dancers were dressed like red condoms with a glittery hand on their head! I mean what was that!!! Overall, it wasn’t my favourite. Not enough activities onboard either since we can’t sun bathe due to the weather. Just a shame as I loved this ship the first time around! We took a taxi from the port to Olympia (€80). There’s not really much to see here but it was a relaxing end to the trip as you can get a beer or gelato and sit at the port. We took a taxi to Budva outside the port (€80) - there were 4 of us so not so bad. Budva is nicer than Kotor itself in my opinion, worth visiting! This is my second time in Venice and if you’ve seen it once you’ve seen it all. I would suggest to take the water boat to Murano (Take route 3) - about 20 mins from Piazzale Roma, and ~35 mins from Murano you can go to Burano (Take Route 12) which is much nicer and less tourists!